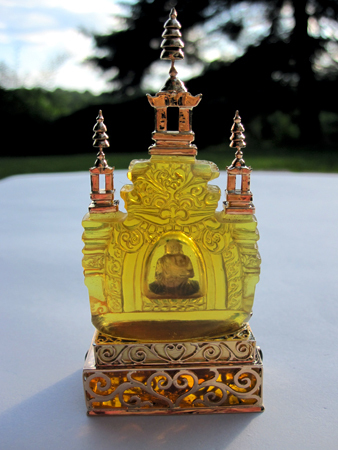 Dimensions (HxWxD): 3.5" x 1.5" x 0.98"
This magnificent museum-quality 22 karat gold hand-carved gemstone Buddha Temple was created by Pedro, a talented artist and shamanic practitioner who resides in Tokyo, Japan. This is an amazing design, flawlessly executed, with the intricate carving on the Buddha and on the temple visible front & back as can be seen here in these photos. 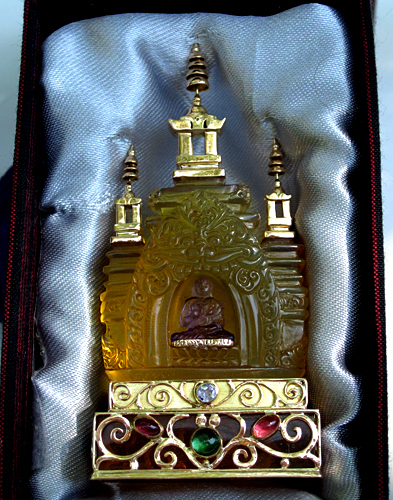 This unique, one-of-a-kind gemstone Buddha Pagoda Temple is both an energetically powerful altarpiece and a truly world-class collector's item, and is large enough to serve as a central focus for your home meditation altar, your night table, or anywhere you would like to elevate the energy signature of your environment and invoke the Spirit of the Buddha. The value of high quality cut crystal gemstones and collectible minerals has skyrocketed in the last five years, increasing as much as 1,000% in many cases, according to the November, 2006 edition of the Forbes Collector newsletter, and this beautiful specimen is truly a magnificent addition to any mineral or gemstone collection as well as an excellent investment. 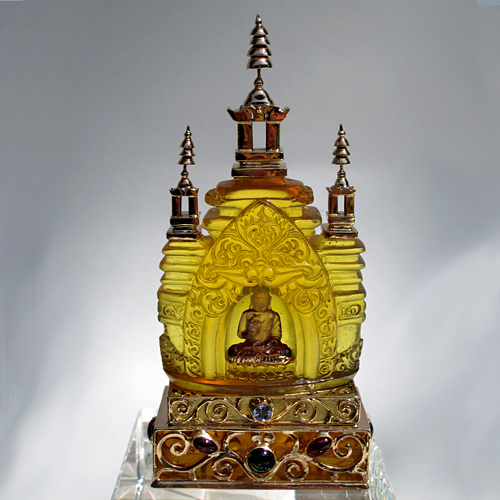 Pedro's carved gemstone Buddha is made of Amethyst, seated regally in a meditation posture on a 22 karat gold cushion within a luscious warm toned 38.5 carat Yellow Amber Temple, with an intricately carved Lotus Flower above the Buddha's head. The Yellow Amber Temple, weighing 1.45 ounces and standing 3 1/2 inches tall, sits within an intricately carved 22 karat gold base studded with 4 green tourmaline gemstones, 1 red tourmaline gemstone and 1 tanzanite gemstone. The Temple is crowned by three soaring multi-tiered 22 karat gold finials, creating a regal and elevating architectural triumph in miniature, with the look and feel of a Southeast Asian pagoda. Amber is one of the few non-mineral gemstones popular with lovers of fine jewelry throughout the ages. Amber is fossilized tree sap which is on average 30-90 million years old. Amber talismans and other amber artifacts dating from the Stone Age abound in archaeoligical sites in Prussia, Denmark and Schlesswig-Holstein. 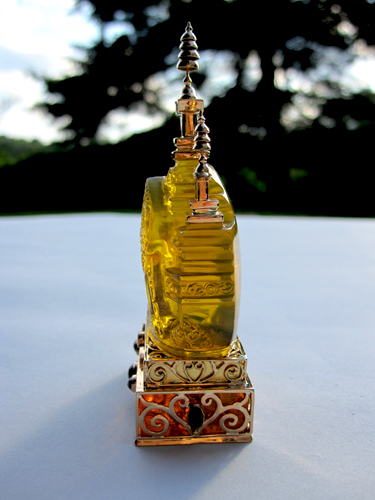 Amber is a stone of purification, cleansing and personal empowerment. Crystal healers use amber to transmute negative energies into positive energies. Prehistoric shamanistic practices included the burning of amber in fire ceremonies designed to cleanse the environment of all detrimental influences. Amber is also considered to be a golden stone of manifestation, empowering the bearer to manifest their desires and dreams into material reality, bringing love into one's life, strengthening marriage vows, and bringing good luck and protection to spiritual warriors. All forms of tourmaline are thought to balance the left and right hand sides of the brain, harmonizing rational thought with intuitive insights. Tourmaline helps release victim consciousness and maintain a sense of humor, faith and confidence in the reality of one's own inner vision. Crystal healers say that tourmaline can be useful in the treatment of ailments of the nervous system and to purify blood/lymph toxins. This gemstone is said to neutralize fears, resentment, neurosis, and obsessions. Healers use tourmaline to treat intestinal or spinal energy blocks, release toxins, combat constipation, and provide relief in cases of neuralgia, migraine headache, and burns. Tourmaline is thought to support healthy lungs, and to relieve lower back pain, asthma and arthritis symptoms, swelling and immobility. Common tourmaline is black, and the lighter colors, such as blue and light green, are much more rare. The colors in the stones are created by the presence of various metallic ions such as iron, titanium, chromium, and others. The various colors of tourmaline are associated with the seven primary chakras within the human aura. Metaphysically speaking, green tourmaline is an excellent stone used to open the heart chakra, imparting a feeling of love, peace, serenity & deep compassion for all living beings. Green tourmaline, also known as a Brazilian Emerald, is associated with the heart chakra. Green tourmaline helps us to see with the heart, to combine a masculine strength with compassionate creativity, and to facilitate the study and practice of agriculture and herbalism for nurturing and healing. Wear this color to help when communicating with devas and nature spirits. In addition, green tourmaline is said to help connect the heart with the third eye, facilitating clairvoyance and fostering a deep experience of Unity with Universal Creation. Rubellite or Red Tourmaline, relating to the astrological sign of Scorpio & Sagittarius, is associated with the root chakra, and helps ground and center the bearer, assisting in the overcoming of paranoia, low self-worth, and feelings of alienation. Red tourmaline exhibits a magnificent ruby violet shade and resonates with the heart and base chakras, assisting in grounding the energies of love & devotion. It can intensify any loving practices whether directed toward ones own health or in the spiritual practices of devotion. 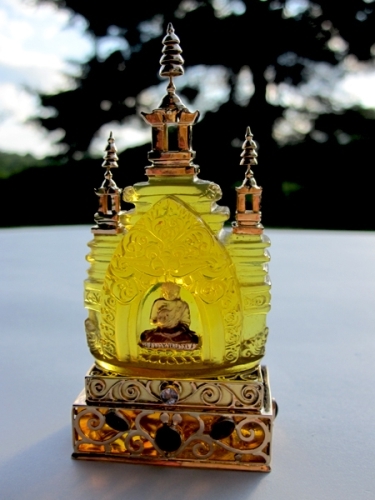 This gemstone Pagoda Temple has been cleaned with Universal Life Force Energy, and given an energy attunement using Reiki, a Japanese technique of energy healing, so it will continue to receive and transmit Universal Life Force Energy direct from the Source of Creation. It has also cleaned and charged with the natural energy of sunlight. It is ready for you to program according to your own needs and desires. Weight above is shipping weight. Net weight is 41.11 grams.